My husband and I always do matching costumes with a slightly dark twist. 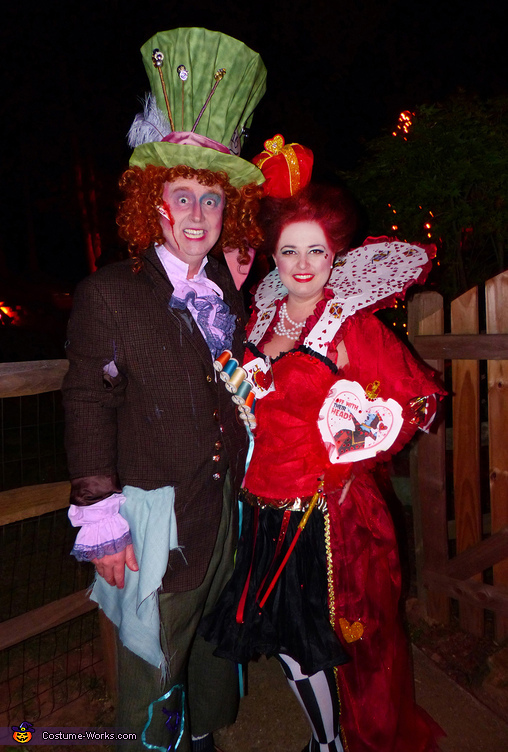 This year, we decided on the Mad Hatter AFTER the Queen of Hearts has tried to take his head off. On both costumes, the accessories are the stars! For the Mad Hatter, the key piece is his hat, of course. I built the frame – more than 14 inches tall! – with strong poster board covered in bright green marbled fabric. It is accessorized with hand-made hat pins, an iridescent salmon-pink sash I sewed, a dyed purple feather and steampunk timepieces with buttons. For his signature “10/6” card, I hand drew the design and used a burn technique to distress the edges. On the underside of the hat, I attached pieces from a bright red dance wig our daughter no longer uses. For the Hatter's injury, I attached a hearts playing card slice to his face with liquid latex and fake blood. A thrifted men’s tweed blazer, which I heavily distressed. To emphasize the Hatter’s craft, I added a mixture of buttons and watch faces, as well as brightly colored ribbons and a distressed fabric remnant in the pocket. Thrifted men’s herringbone dress pants, which I dyed green, cropped and distressed at the hems, and added ribbon accents. A ruffled collar men’s shirt that I dyed purple. For the Queen, I constructed a massive Elizabethan-style collar from playing cards attached to a wire frame, backed with red fabric and accented with ribbon, glitter tulle, and playing cards. The collar attaches with Velcro to the red corset, which I overlaid with red tulle. I then hand-beaded the bodice, added Queen of Hearts playing cards and a red rhinestone heart. The ruffles on the bodice are from thrifted dresses – one of gold lame and the other a black accordion-pleat organza. The black dress I also cut down to make the Queen’s underskirt. I then beaded it and added glitter ribbon accents. I made the red bustled overskirt from a damask tablecloth, adding gold ruffled hearts on each bustle. I overlaid the entire skirt with red glitter tulle and edged it with gold braid. I also made a cape from the tiered ruffle off another thrifted dress, adding a pearl necklace closure. The queen’s accessories include a crown I made from gold glitter craft foam, which I attached to a headband and filled with tulle. I made a craft foam heart accented with clear crystals to top the crown. I made her scepter with the handle of a butterfly catcher from the Dollar Store, painted red and covered in glitter craft foam strips. I designed an "Off With Their Heads" sign, beaded it with red crystals, distressed the edges with the burn technique, and edged it in tulle. At the top of the scepter is a tiny replica of the queen’s crown. Then I styled my hair in a large heart-shaped bouffant and sprayed it bright red. People are always amazed at our attention to detail and level of creativity. We get lots of questions about how we made the costumes. Because so few people we know sew or craft, they can't believe we do all this ourselves. We wore these costumes to a massive community Halloween party that has a wide variety of costume competition categories. For the second year running, we won the grand prize! I spent about a month making the costumes and less than $100 on supplies and thrifted items. Much of the fabric and ribbon came from my own stash. Some of the pieces – such as the men's shirt – are ones I have used in the past and repurposed here.